Historical records indicate the pronghorn antelope population may have numbered nearly 40 million at one time, which would have made it as abundant as bison. During the early 20th century only about 13,000 remained, but thanks to competent management there are about one million pronghorns alive today. In 1907 Nebraska passed a law prohibiting the taking of elk, deer, antelope and beaver, and there was no antelope hunting season until 1953, a period of 46 years. A 1925 publication cited that only 10 small bands totaling 187 animals remained from the thousands of antelope which once roamed the Nebraska plains. In 1955 antelope numbered around 3,500. By 1974 there were about 10,000 pronghorns in the state. From the mid- 1970s the population declined for various reasons. Major losses were attributed to the 1978-79 winter when some herds suffered mortalities of 60 to 100 percent. Today, the number of antelope in the state is estimated at about 6,000. The greatest losses occur during the first two months of life. Only about 40 percent of the fawns born in June live until mid-July. In Nebraska most of the 60 percent loss of fawns is due to coyote predation. Coyote control can improve fawn survival, but it is not economically practical on a large scale. In a few areas bobcats are important predators and in areas close to bluffs golden eagles kill and feed on fawns. Adult mortality probably averages about 10 percent annually. 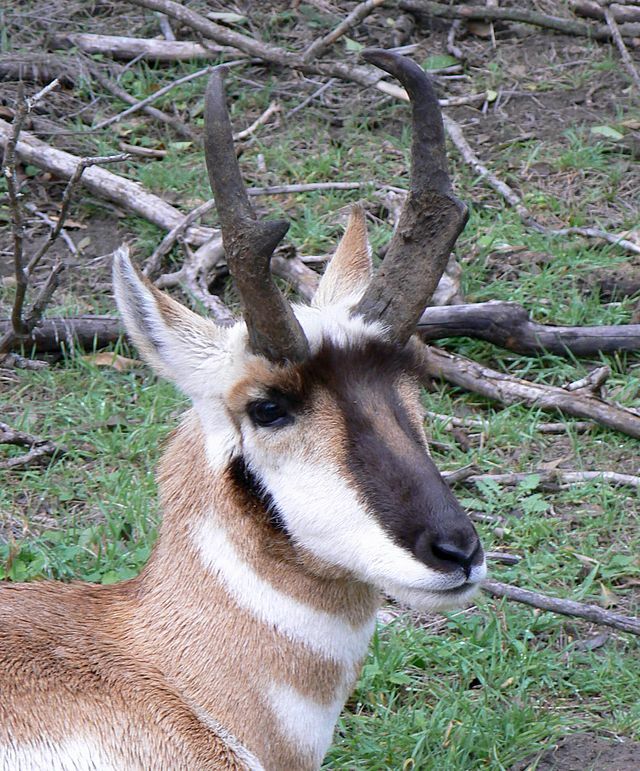 A major portion of the pronghorn’s’s diet is composed of forbs and browse plants, but normally little grass. In Nebraska where browse species are lacking on the antelope’s range, pronghorns utilize winter wheat and alfalfa. Wise range managers encourage pronghorns to use their rangeland to discourage the increase of undesirable plant species. Pronghorns also consume poisonous and injurious plants, including larkspur, loco weeds, rubber weed, rayless goldenrod, cockleburs, needle-and-thread grass, yucca, snakeweed, Russian thistle and saltbush. Antelope occur primarily in the western half of the state with their major range in the Panhandle. Highest densities are in northern Sioux and Dawes Counties.